Anyway, I couldn't wait to try my variegated Aurafil threads that I came home with on Friday. So since this is the last day of my Free Motion challenge, I thought I'd try out my new threads. I did learn a bit while testing them out. This first picture, I'm using a 28/2 wt Mako variegated thread. It is beautiful to sew with and because the thread is a heavier weight than I'm used to it shows up so nice. Even the parts of the thread that are the same color as the background fabric. 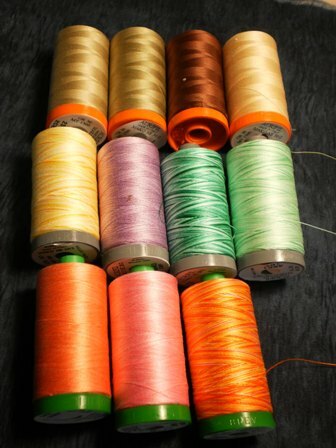 What I don't think I would do with this thread, is use it when I had to go over my stitches as you would do in pebbles. 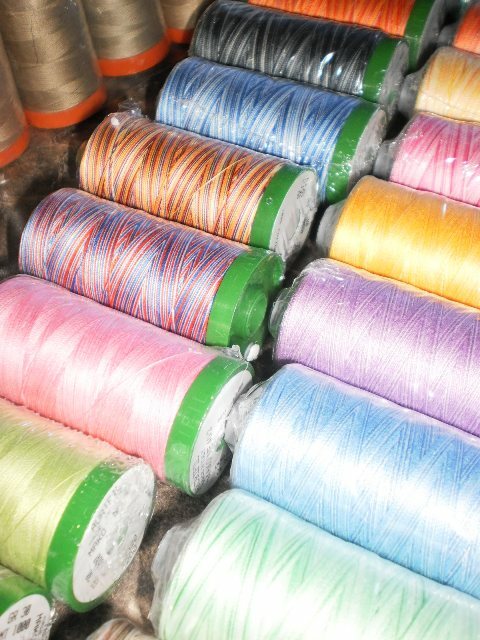 The heavy thread would make the pebbling look too thready. Here I am trying to combine a few simple free motion patterns to get an all over free motion fill. This actually stressed me out because I got trapped in a corner once. In this photo, I'm using the Mako 40/2 cotton variegated thread. I really like it as well, and you can see I slipped for a moment and did a feather. But I did it so I could try some bananas around it, which are a more dense filler. This thread is also very nice and noticably lighter than the 28 weight. A good weight for the smaller fillers. It was a good exercise for me to try the different weight threads. Early on in the challenge I learned that I would probably not enjoy doing free motion with 60 wt thread because of the breakage. It looks like 40 wt, and 28 wt are my comfort zone. It's been a great challenge girls. Once again, many thanks for hosting. 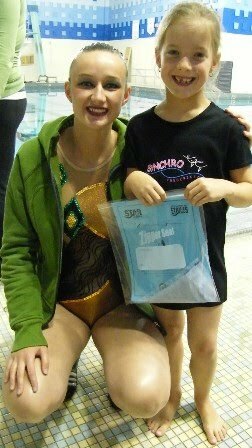 Congratulations to my Granddaughter Caitlin who achieved her Star 1 and her Star 2 certificate for Syncro Swimming. Here she is with her coach, who presented her with her award after the year end water show. 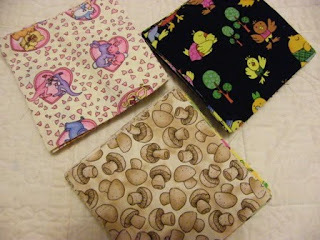 I'm so glad that we have over 40 swappers on the I spy charm fabric swap that I announced recently. I have been on the lookout for nice ideas for I spy Quilts for these swappers. They might be nice for you too, if you are in the mood to do an I spy quilt. I have gathered these photos from here and there around the web. I'm sorry, that I didn't think to take credits since I thought they would be a good reference for me and I didn't know I'd be sharing them with you. 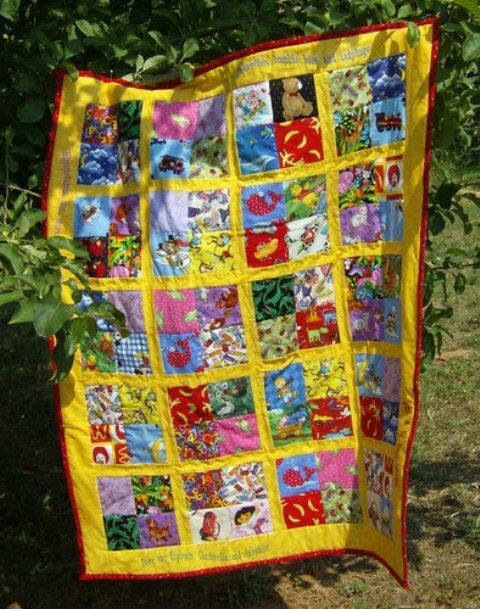 Are you a "Quilt as you Go" (QAYG) type of person like me? 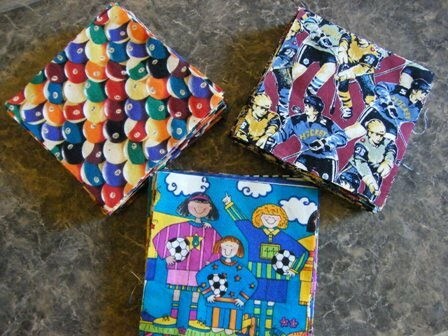 Why not put 4 charms together to make large 4 patch blocks. 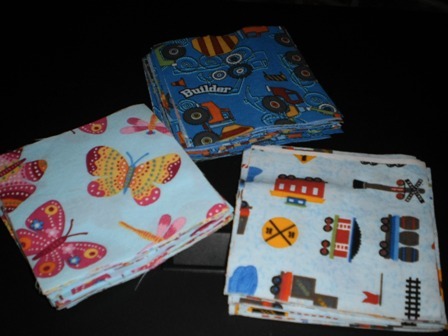 Then quilt the blocks before putting them together. I use this method of quilt as you go from Quilters Cache, but there are many others available. 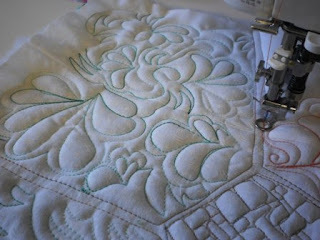 Another quilt as you go style is the simple 9 patch. 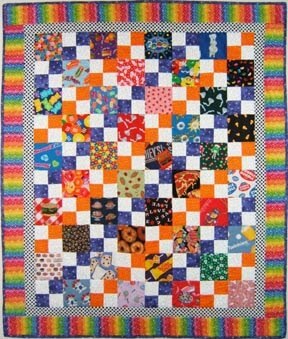 Here is a 9-patch that uses plain primary colors as alternating patches. Great space for practicing your machine quilting. 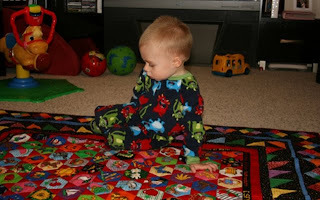 Use 12 blocks and a QAYG method for quick 45" x 60" kids size quilt. 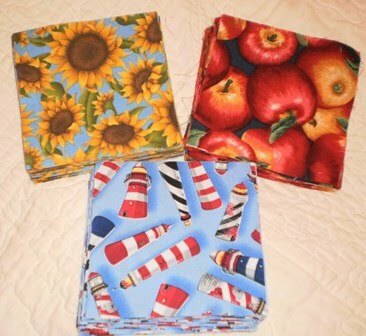 If you have to make your 120 charms stretch to make 2 or three quilts, you can always do an alternating checkerboard pattern with I spy charms in every other block, and a solid color in the other. 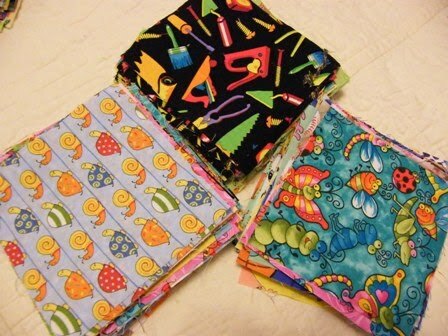 Put on a great big border, and you have a fun lap quilt. This pattern is a popular pattern, but I haven't seen it used for I spy too often. It's sweet. Quiltville has a pattern called Smokey Mountain Stars. Use charms in every block as shown here or every other block as shown in the pattern. A free "I Spy a Four Patch" pattern from Quiltville uses 4.5" I spy blocks. This has a secondary pattern that is diagnol rows of light or dark colored small squares. Check out Bonnie's gallery on webshots for other colors. All are really nice, and can be made for a boy or a girl. If you have some additional I spy Rectangles of fabric, why not try this fun quilt. A similar pattern to this one can be found at Marys Site. It's called Framed Rectangles. Go here to download. This is a Disappearing 9-Patch (D9P). 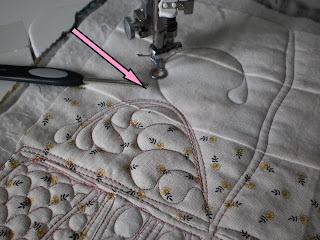 The trick here is to put I spy Charms in the 4 corners of your 9 patch block before cutting. Want a tutorial for the D9P block. Check out the tutorial on the Moda Bake Shop here. Snowballs - click here to see a method of making snowball I spy blocks. Since we're collecting 5" charm squares, you might consider adding smaller snowball corners rather than the larger ones that this link calls for. Hexagons. This looks like a complicated quilt, but with the right tools, it's easy. 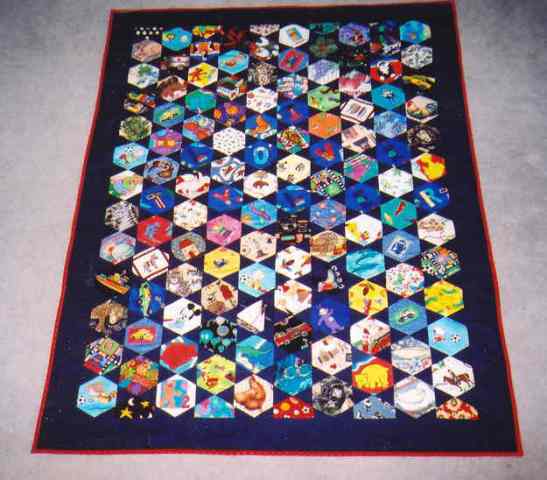 Here are various Hexagon I spy quilts made with various background colors. The secondary pattern of course is a star. Do you see it? Some of the red blocks with red points are easiest to see. On this first hexagon quilt, look closely at the inner border, some of the I Spy items are named. 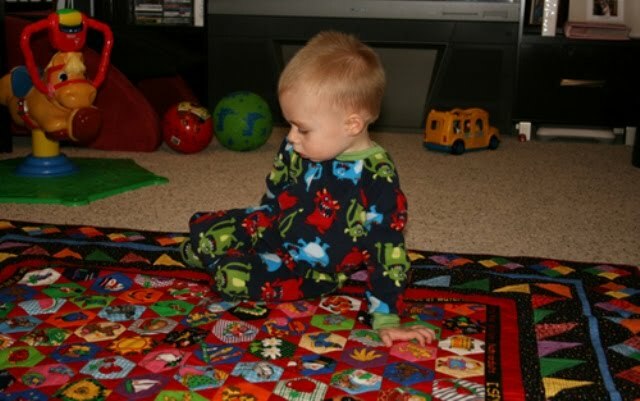 This little guy's PJ's makes him dissappear right into his quilt, wouldn't you say? 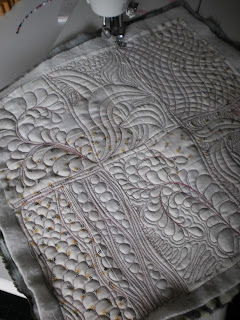 What's good to note in this quilt, is the exquisite pieced borders and how they play right into the colors of the middle of the quilt. And last but not least, this hexagon quilt is accented in black. 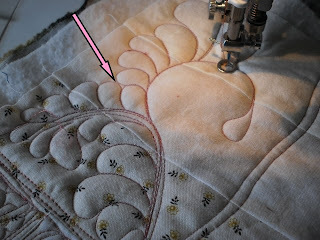 Using a light colored thread, I like the idea of quilt writing some of the names of items to look for on the dark border. Go to Part 2 of "I Spy" inspiration. For those who want to see, I am adding photos of the fabrics for the I spy swap as I get them. 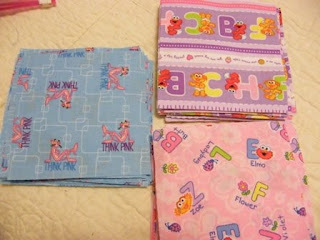 These fabrics have come in as of June 17, 2010. 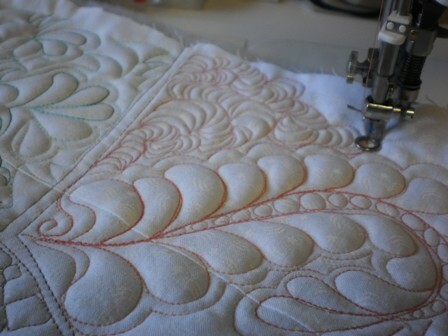 I went to the Maugerville quilt show yesterday and it was a great little show. 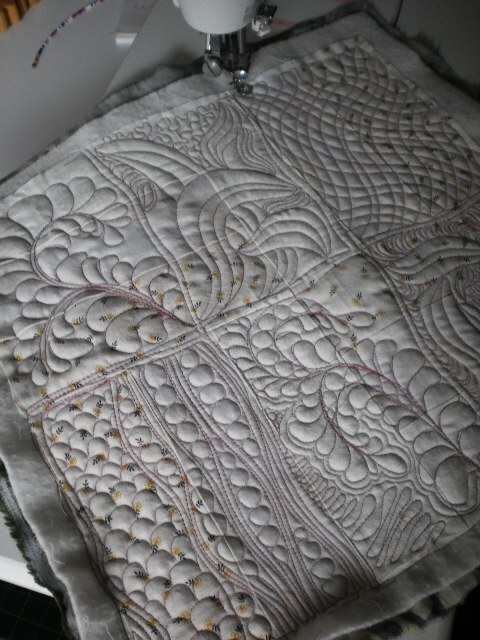 We saw some current quilts and some great old favorites. I was so focused on remembering my thread and other things to give to the Friday girls, I totally forgot to bring my camera, so thanks for the use of your camera Lee. 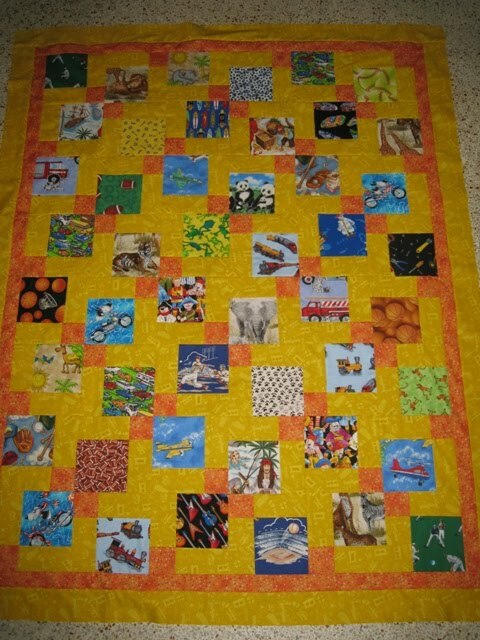 This is the quilt that kept me awake last night. 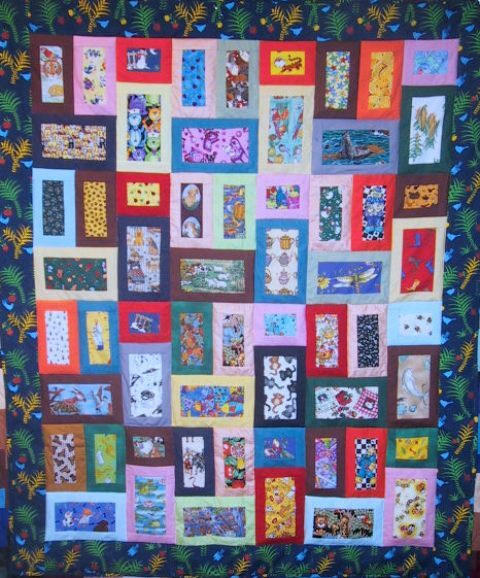 It is a Mystery quilt that Don Coles did for the Cotton Mill Quilters Guild, which I am now a member of. It has a large star medallion for the center. It is surrounded by mock log cabin blocks, and then stars, and a great border. And do you all remember this Teddy Bear pattern from a magazine years ago. 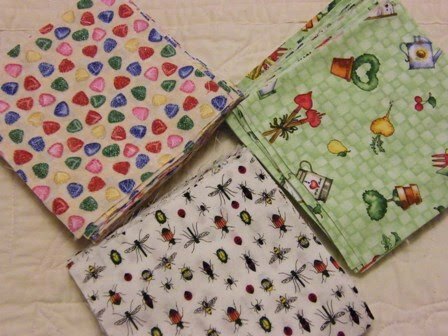 I still have the pattern, and I still intend to make this quilt. Who for, I don't know. I really enjoyed seeing this hexagon I spy. 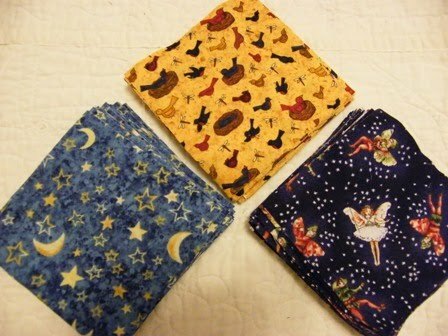 I have the Marti Michel Quilt Sense Hexagon kit and this fall, I'll be making one for Aurora. Notice how they put minky on the back. I don't think there was any batting. The minky was just enough. Also, I think putting a sleeve on it is a great idea. 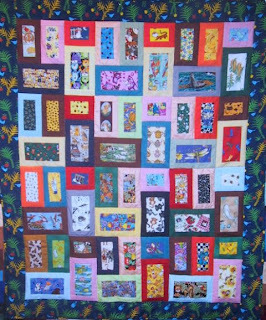 I love a scrap quilt and I've seen this pattern, called Kitty Corner, at a few shows. It's speaking to me. In fact I've started cutting 2.5" strips from scraps and setting them aside. 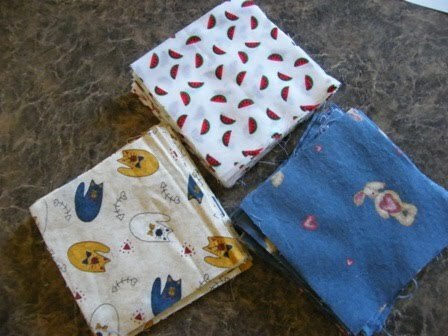 I think this is the next scrap quilt. But just over from the Kitty Corner Quilt, was this scrap quilt. Oh, I love the secondary pattern it creates. 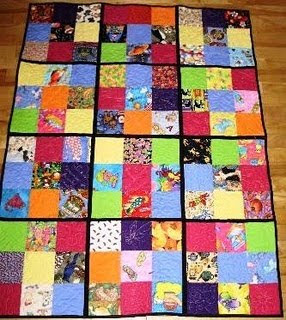 I can't quite make out the name of the quilt by enlarging the photo, but I know the lady who made it, and next time I see her, I'll ask her the name of the pattern, just in case that this becomes my next scrap quilt. Take a look at all the different fabrics. It is was made from a fabric traded at a swap. 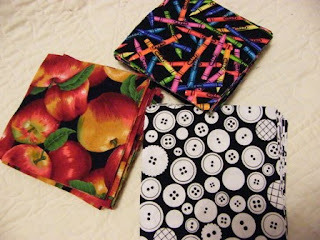 Great idea for that true scrappy look. 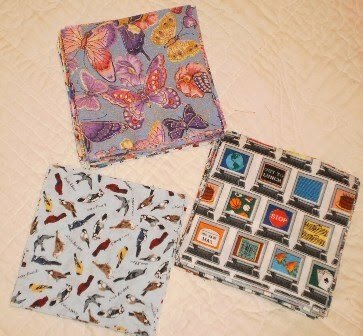 There have been lots of One Block Wonder quilts at shows lately. They are all fun to look at. I think I must be moving into my black phase. 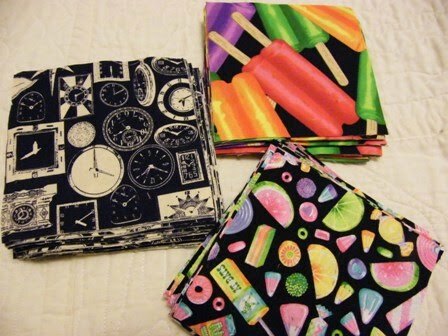 I am unusually drawn to quilts with black in them. 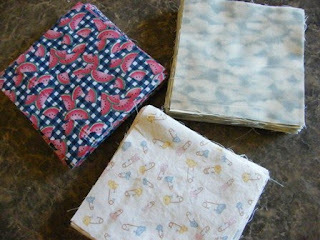 This one was wonderful and I loved seeing the original rooster fabric on the back side. Well, I hope you enjoyed some of my pics from the Maugerville Show. I'm down to the last few days of my Free Motion Challenge. I'm determined to finish a free motion sampler that I started in January. I have about 6 of 12 sections done and I'm looking for new and different fills so I don't use the same fill twice in this piece. So, I turned to my Dianne Gaudynski book and thought her bananas were pretty nice. Her suggestion is to stack bananas for a bit then do some pivoting. So this is my very first attempt at stacking and pivoting. As you can see I'm very uneven in my stacking, but I know better now this will be the next fill I add to my sampler. I met with the Friday Girls this morning and we had such a hard decision to choose our colors. We chose in Hockey Draft style. 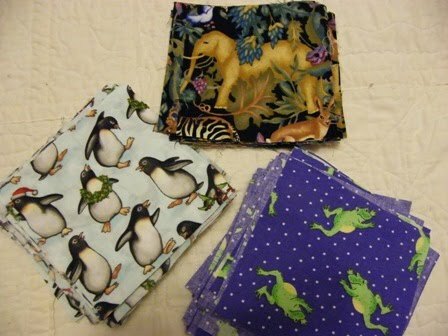 These are my threads. Four Piecing threads 50 wt, Four 28/2 weight threads, and three 40/2 threads. I'm going to try them all out next week to see what they stitch out like. 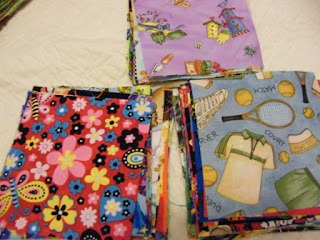 Watch my blog tomorrow for some of my favorite quilts from the Maugerville Quilt Show we visited today. Those girls put on a wonderful show and everyone there is so friendly. I'm quite excited today because early this morning, the mailman brought a parcel of Aurafil thread that I had ordered last week. Three of the Friday Girls and myself put in a combined order of about 50 spools of thread, and it all came to me. So I get to look at it before we divvy it up tomorrow while we have coffee. 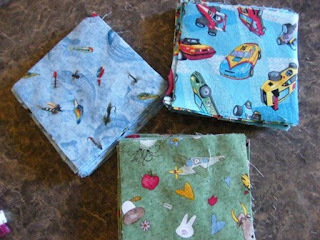 Speaking of coffee, our Friday coffee break tomorrow will be at the Quilt Show in Maugerville. 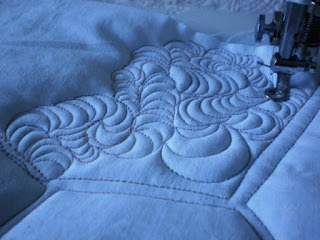 So tomorrow, I'll show both my picks of thread, and my pics from the quilt show. It was hard to get back started on my Free Motion Challenge after a 6 break. But once I got started, I was good to go. 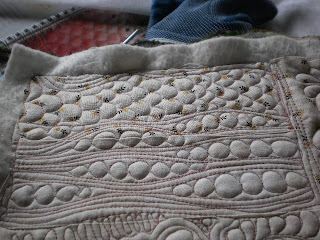 First thing I did was finish the clam shells and circles in my wavy patch that I had started last week. 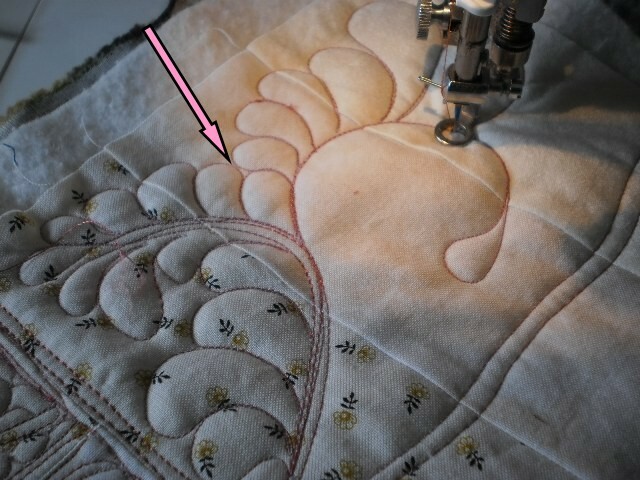 I then moved on to do a feather (see demonstration below), then on to some Mctavishing and a wavy crosshatch. I really need to study the McTavishing. I like the look of it, but I need to understand how it's done and how to get out of a corner etc. 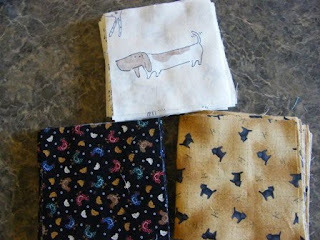 So, I'll add this little sampler to my little pile of samples that need to be bound. Last week, one of the girls in the challenge asked how to make a split in a feather. I had been looking at my Dianne Gaudynski' book and in her feather diagram, I noticed that she puts a nice little tear shaped feather in the middle of the split. That way, you can feather on each side of the teardrop. We're back from a wonderful warm Victoria Day weekend at the lake. Here is Auntie Donna and Uncle Terry giving Aurora her very first Kayaking lessons. 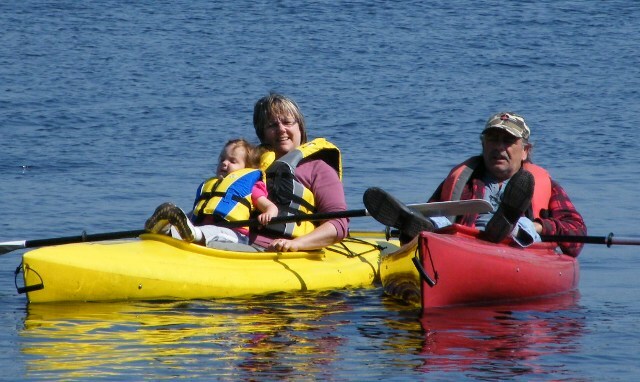 Notice that Aurora is putting her feet up on top of the kayak just like Uncle Terry. Donna and Terry's youngest daughter Michelle and her husband, Scott also came for the weekend. 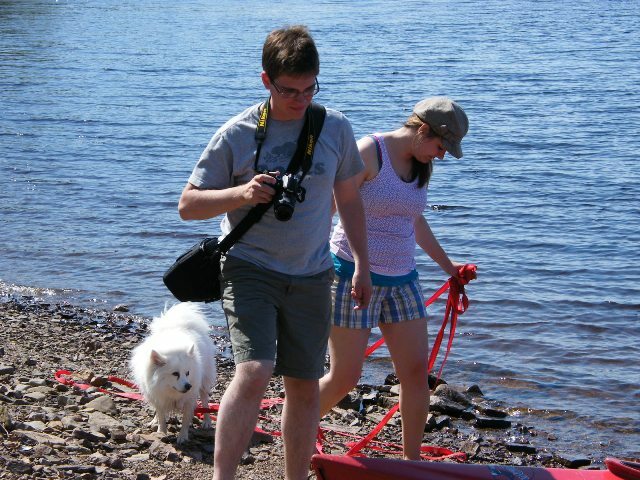 Their little pooch Lucy loves the water, much to their surprise. We had a good time watching the spring geese take all their little goslings for a swim. 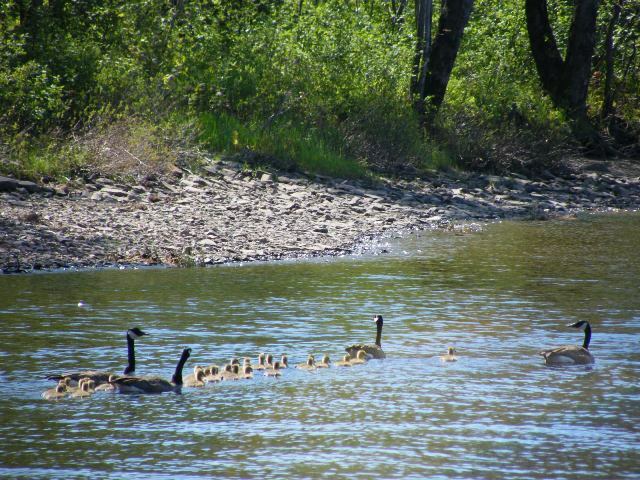 I think I counted 28 goslings in this picture. The swam to shore, and went for a little walk, then got back in the water to swim to another beach.